Making it two DJ rallies in a row was Gavin Walton on his trusty 1936 500cc AJS Model 9. Walton brothers Gavin and Kevin, from the East Rand, proved the dominant force in the 2018 DJ regularity rally for classic motorcycles. They took the first two places out of an original entry of 103 in this annual event in South Africa which takes competitors on a two-day route from Durban to Johannesburg. This was the third time that Gavin Walton has won the DJ, with previous wins in 2009 and 2017. Gavin’s total error at the various timed checkpoints on the 673km (418 miles) route totalled 256 points. He rode his reliable 1936 500cc side-valve AJS. Kevin Walton (1931 500cc BSA) had a total penalty of 460. Third place was filled by three-time DJ winner Martin Davis (1930 500cc Sunbeam) while Allan Cunninghame (1936 500cc Velocette) was fourth, ahead of 26-year-old Martin Kaiser (1935 500cc Sunbeam), who was the youngest finisher. There were 72 finishers this year, with 11 retirements and 18 non-starters. Oldest finisher was 82-year-old Neville Smith (1936 350cc Ariel Red Hunter), who placed 18th, while the highest placed woman was Dorian Radue, a regular competitor from Australia, who took 12th place on a 1935 250cc Rudge. 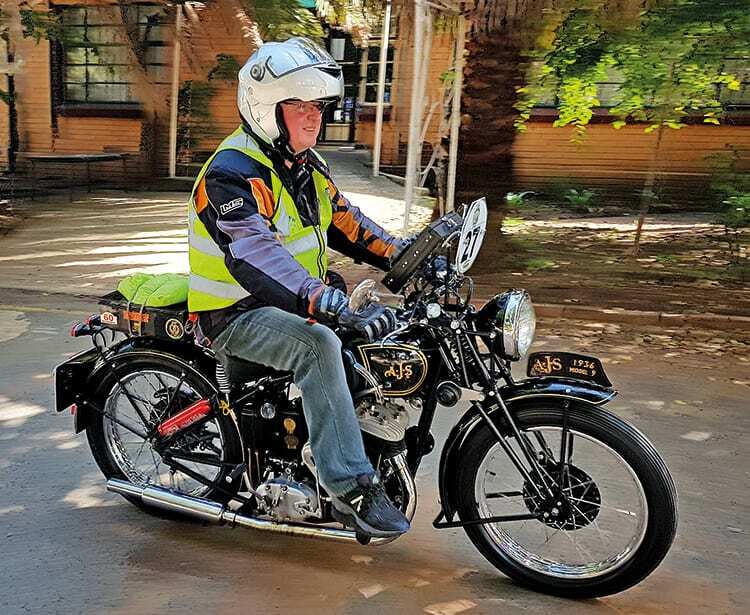 Deon Malherbe (1934 500cc Sunbeam) was the highest placed first-time entrant in the 2018 DJ, in 25th. Tony Lyons-Lewis (1928 500cc Norton) received the award for the most DJ Runs completed, with the 2018 event being his 36th finish.